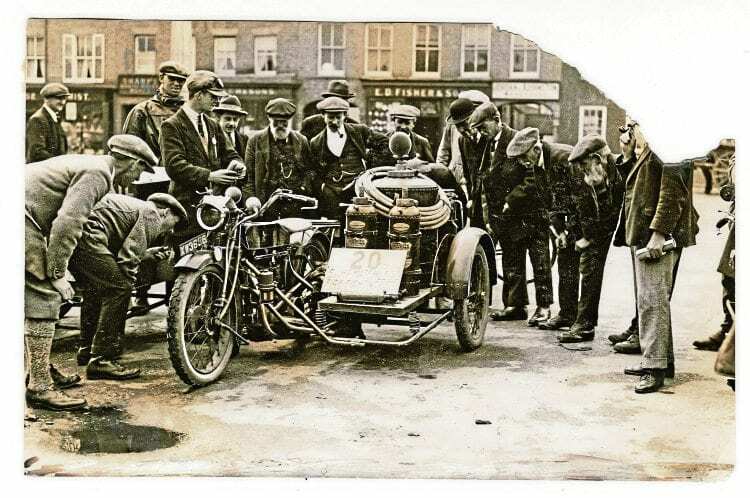 Many of us still regard the sidecar outfits that were once so commonplace as ‘cheap family transport’, and that they certainly were – but Pete Kelly delves into the Mortons Archive to find a remarkable record of their early commercial use. 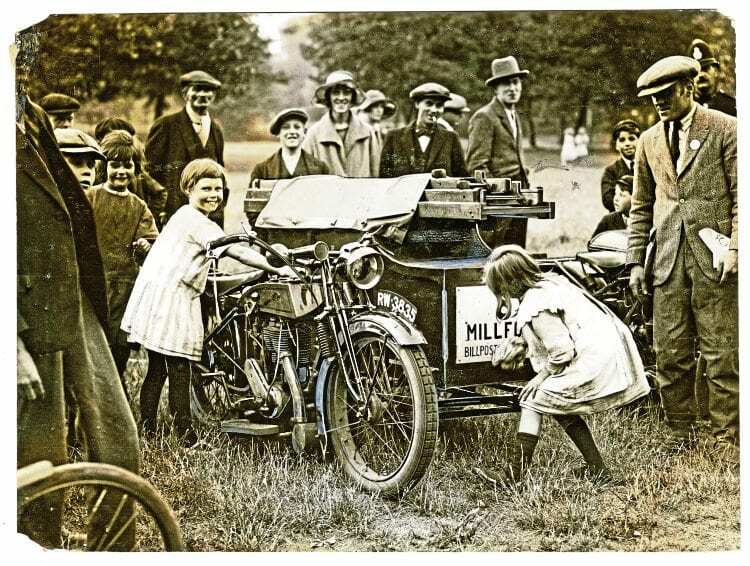 Long before plastic bottles had been thought of, a suitably-dressed delivery girl (or boy?) 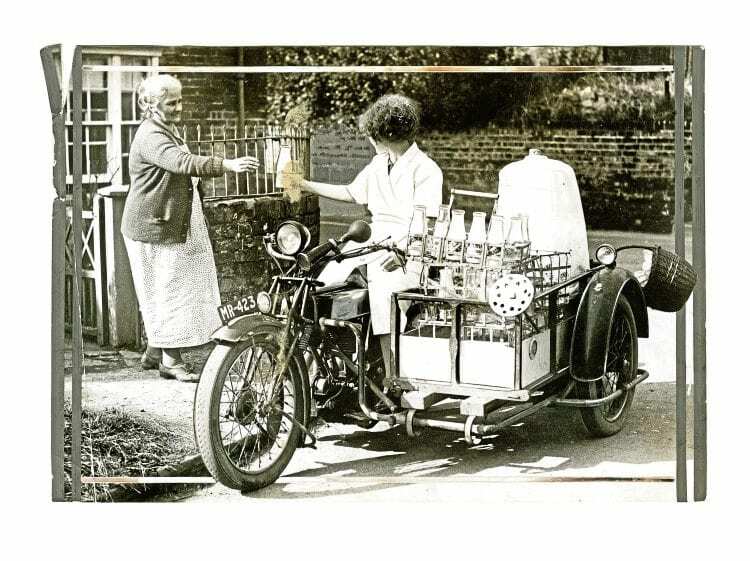 on a ‘crate’ sidecar outfit hands over a daily ‘pinta’ in a wide-brimmed and eminently recyclable glass bottle to an old lady standing at her gate. Anyone who saw the recent TV footage of the furious tropical storm that hit the Philippines will have spotted hordes of small motorcycles attached to home-made sidecars, using whatever materials had come to hand, as primary transport. Before TV advertising came into vogue, many advertising campaigns were conducted on street billboards and the bill-poster, with his ladders, paste buckets and pasting brush, was a familiar sight. These children are obviously enjoying themselves as they play around the outfit of a bill-poster whose name is partially hidden but might have been ‘Millford’ or such-like. That remains the case in many small and relatively poor countries today – and that’s certainly the way it was in Britain from the beginning of the 20th century until the 1920s and beyond. 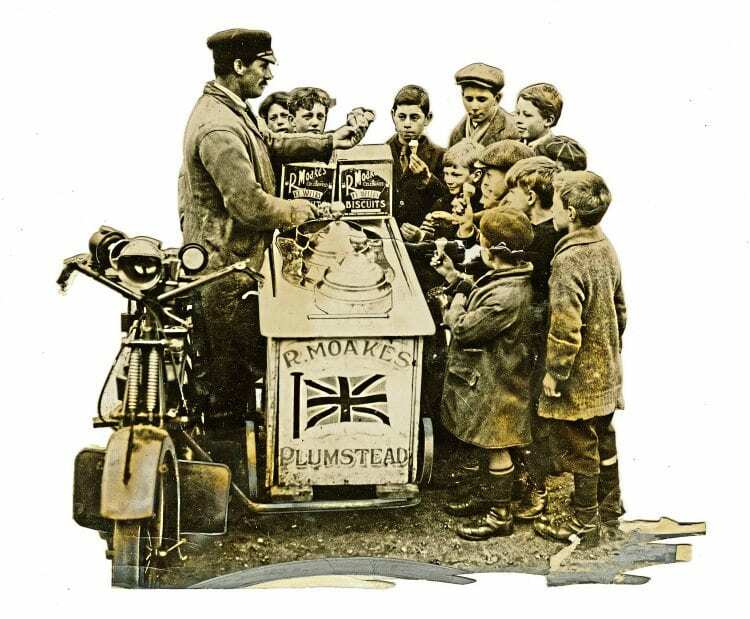 Ice-cream cornets are handed out to an expectant group of young boys from an outfit belonging to R.Moakes of Plumstead. The precious images on these pages, some battered and bruised from more than a century lying in the box files of The Motor Cycle and Motor Cycling, tell an amazing story of enterprise and inventiveness in tough times, when sweeping chimneys, transporting farm animals to market and delivering milk, bread, ice-cream, fruit, vegetables, meat, fish and poultry to customers’ doors were just a few of the commercial uses that relied on the humble motorcycle combination. As the saying goes, one good picture is worth a thousand words – so let’s just let these wonderful pictures tell their own story. View more images in the October 2018 issue of OBM – on sale now! Next Post:Sprinting – two classic sprinting events in one!